Saxony-Anhalt to status as logistics hub of Germany. rom automotive manufacturing to the chemicals and life-sciences sectors, few factors are more important to global competitiveness than speed to market. In fact, for some industrial companies, the presence of a superior transportation and logistics network is the most critical component of all. In Saxony-Anhalt, Germany, logistics is at the heart of the state's business growth strategy — and a world-class transportation network is the driver. Benjamin Looser, senior manager of the hub operation of Lufthansa Cargo AG at the Leipzig-Halle International Airport, says his company benefits from its location in the "modern logistics center of Leipzig-Halle." Moving 45,000 tons of air cargo a year through the airport, Lufthansa handles a wide variety of import, export and transit traffic. "We started after the wall came down in 1990," Looser says. "But that was just for local services for the region. In 2007, we expanded and opened up our air logistics hub by adding transit freighter flights in and out of Germany. Since then, we have grown steadily over the years. In the future, we expect to experience continued growth in the volume of our business." Lufthansa employs 15 full-time workers and another 35 indirect workers through a contract service provider, Port Ground. Lufthansa occupies 250 square meters of office space and another 4,000 square meters of warehouse space that is expandable to 8,000 square meters. "We are a 24/7 air cargo operation," says Looser. "We have a well educated and highly motivated staff. They are very solutions oriented. Most of our workers are hired from within the local region. Training is done internally on the job. Our brand name gives us the opportunity to select the best employees." The business advantages of being located at Leipzig-Halle are considerable, notes Looser. "The new transportation infrastructure in this area — including the highways and railway station — is one of the very best in all of Europe," he says. "The cost structure here is very advantageous. Salaries are affordable and the rent for the logistics center is quite competitive. We have a direct apron connection at the airport, and we can fly in all kinds of weather here because of the technical capabilities." Looser says government support makes expansion easy for companies. "In general, it is very uncomplicated to get assistance from the government here," he adds. "It is very fast, because they make very quick decisions." Lufthansa is one of many air cargo operations based at Leipzig-Halle. AeroLogic, a joint venture of DHL Express and Lufthansa, employs 230 people at the airport, including 175 who are cockpit crew members. AeroLogic uses eight brand-new freighter-type Boeing 777F aircraft, which have a maximum payload of 27 containers or 106 tons. Maximum range for this plane is 9,000 kilometers. AeroLogic serves 21 destinations in Asia, the Middle East and North America. On January 11, 2010, AeroLogic completed its first flight to the U.S. Regular flights to Singapore began in June of 2009. The airport is part of a sophisticated logistics network that makes Saxony-Anhalt a preferred location for distribution centers and freight-forwarding facilities. Its central location in Europe and pro-business incentives make Saxony-Anhalt a leading destination for logistics end-users. The presence of DHL at Leipzig-Halle provides a major logistical advantage for southern Saxony-Anhalt, comparable to the impact that the extension of the Magdeburg Port had for the northern part of the state. Public grants and subsidies are available to support expanding companies in Saxony-Anhalt. These financial assistance packages can include investment grants as cash incentives, state development bank loans, work-force training incentives, and grants and loans for research and development. Major logistics end-users in Saxony-Anhalt include Amazon, BMW, Porsche, Deutsche Post, Mobis Parts Europe, Zellstoff Transport GmbH, ProLogistik, Meyer Logistic and many others. Automation in this sector is high in Saxony-Anhalt. At the automated high-bay warehouse belonging to Hermes Fulfillment GmbH in Haldensleben, some 1.2 million boxes of goods can fit into the 100-meter-long, 80-meter-wide and 30-meter-high facility. AeroLogic — a joint venture of DHL Express and Lufthansa Cargo AG — employs 230 workers out of Leipzig Halle Airport. Its fleet includes eight new freighter-type Boeing 777F aircraft, each with a maximum payload of 106 tons. The driver of this sector is the Leipzig-Halle Airport, which handled a record of 760,344 metric tons of air cargo last year, making it Germany's second-largest freight hub. The establishment of the European DHL Hub at Leipzig-Halle has attracted much of this business. Takeoffs and landings rose by 3 percent in 2011 to 64,097. The current freighter schedule includes four destinations in North America, three in the Middle East and 11 in India and Asia. In 2011, the 134 companies at the airport recorded growth of 11.9 percent and employed 5,713 workers. Some 662 people work for the airport itself. "The logistics region near Leipzig-Halle Airport has developed into a major player in this sector both domestically and internationally during the last few years," says Dierk Näther, managing director of the airport. "According to the SCI/Logistics Barometer, it is the most dynamic logistics region in Germany." Näther adds that "construction to connect the Cargo Area South to the national rail network started in September 2011 and is scheduled for completion by the end of 2012. Furthermore, a new cargo handling area with direct road access will be built. The new rail link will enable Leipzig-Halle to connect the Cargo Area South to all modes of transport and further enhance the airport's attractiveness for companies from the air transport and logistics sectors." Saxony-Anhalt also offers 600 kilometers of navigable waterways, four major highways connecting the cities of Berlin, Magdeburg and Halle, and 2,300 kilometers of rail lines. All European markets can be accessed quickly and easily within one day of travel. Staffing the many logistics operations in Saxony-Anhalt are the graduates of several institutions of higher learning in the state, including Otto von Guericke University in Magdeburg, where the Institute for Logistics and Machine Flux Technology turns out many qualified students every year. The university also offers specialized programs in production and logistics. Advanced logistic instruction is also available at the five universities of applied science in the region. Saxony-Anhalt is also leading in the field of research and development: Whether traffic telematics or position finding technologies — research institutes such as Fraunhofer Institute for Factory Operation and Automation (IFF) and ifak Magdeburg e.V. Institute for Automation and Communication are working on making logistics processes safe and more efficient. Kristin Gabor, regional manager for North America of IMG at +49 (0) 391 568 99 22 or by email at kristin.gabor@img-sachsen-anhalt.de. 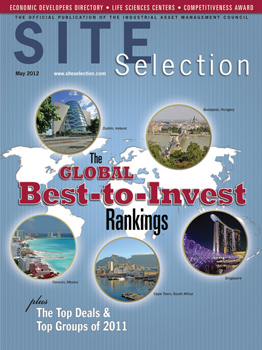 On the Web, go to www.invest-in-saxony-anhalt.com. This investment profile was prepared under the auspices of IMG, the Investment and Marketing Corporation of Saxony-Anhalt.